Develop a deeper understanding of a business so you can deliver exactly what they need. Create job descriptions that show what people should be doing in the business. Having clarity around roles and responsibilities is essential to the smooth running of any business. And yet most job descriptions have no relation to the processes that actually happen in an organisation. With Skore you can define a process and assign roles and responsibilities directly to every step then create job descriptions with the click of a button. Our integrated roles and responsibilities mapping supports RACI / RAPID / RATSI among many others. Quickly tag roles in your process according responsibility level so you can clarify who owns what. 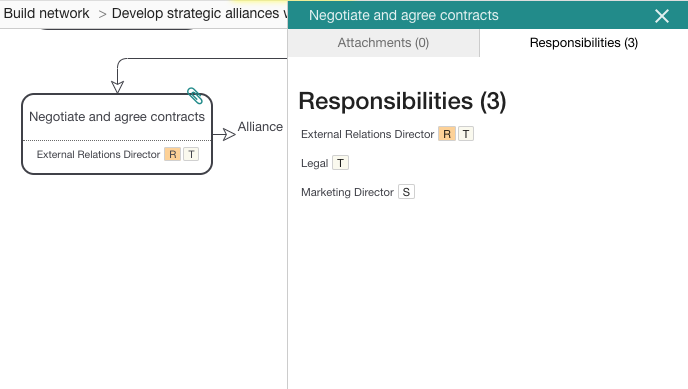 Instantly create a roles and responsibility (RACI) matrix or analyse responsibility levels across all roles. View your own role and see which activities you are responsible for. Instead of maintaining the same data in multiple sources and managing your RACI matrix in spreadsheets use Skore to create them dynamically. Simply capture the processes and add roles and responsibilities to each step then generate a RACI matrix with a click. Automatically keep you RACI matrix in synch with your processes. One click role descriptions tell you what each role does in the process, what systems they use, what documents they need and who they interact with.